Austin Phillips focuses his practice on trademark and copyright law. 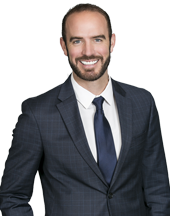 Mr. Phillips has experience in all aspects of trademark practice, including clearance, prosecution, counselling, global portfolio management, enforcement, Trademark Trial and Appeal Board (TTAB) proceedings, and litigation. When Austin is not practicing law, he volunteers on political campaigns supports social and economic justice causes. He also enjoys weekend trips, day hikes, street fairs, board games, and spending time with friends and family.